UMX Color Holders With Stripes For Plain, Pre-Printed and Custom Printed IDs. The BH-180-ST color holders come with color stripes in the bottom portion and with clear pouch on the top. The holders are great for one of the most popular 4"(w)x3"(h) event's ID cards. The color stripes can be used to represent different groups of IDs. And the big area of color stripes are also great for printing. Great for a variety of event ID holders. They come with non-printed and pre-printed with EXHIBITOR, VISITOR and GUEST - in stock and ready to go. Any custom text information and graphic logo printing are welcome! 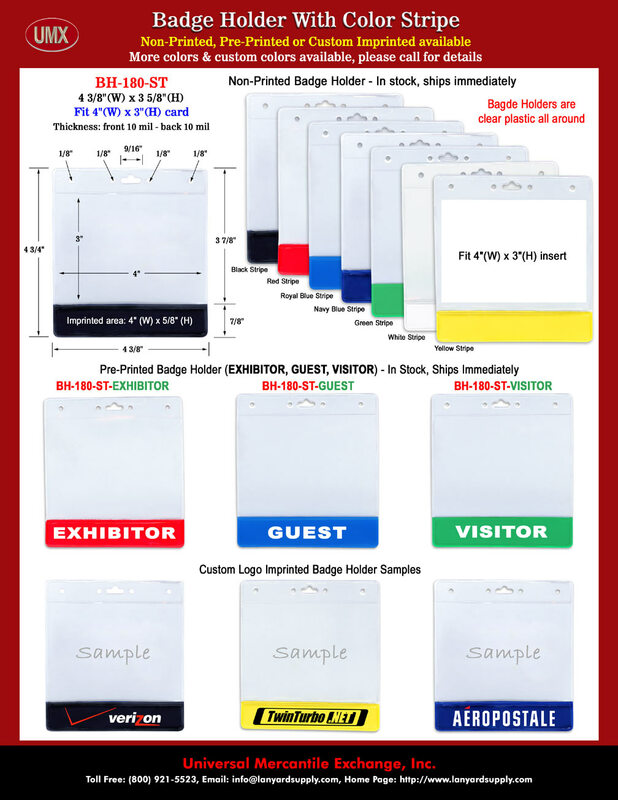 You are viewing Lanyards > Holders > Color Holders Designed For Grouped ID Cards With Plain, Pre-Printed and Custom Printed Models available.